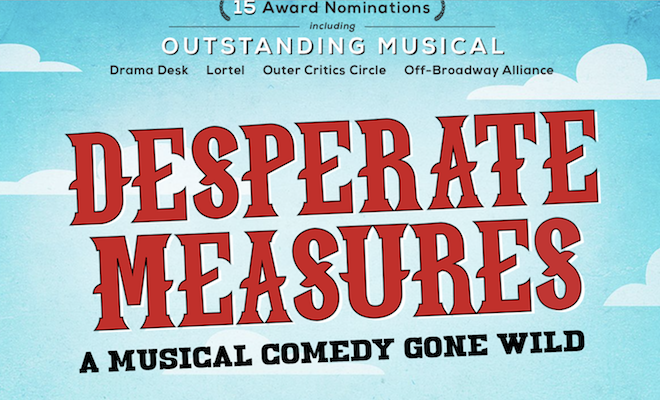 Desperate Measures, a new musical comedy gone wild with music by David Friedman (Listen To My Heart), book and lyrics by Peter Kellogg (Anna Karenina), and directed by Bill Castellino (Cagney, Marry Harry) is one of the most nominated off-Broadway shows of the year. Desperate Measures begins performances at New World Stages (340 West 50th Street between 8th and 9th Avenues) for an open-ended engagement beginning May 30, with opening night set for June 13. The musical features: Gary Marachek (Eleanor) as Father Morse, Lauren Molina (Rock of Ages) as Bella Rose, Sarah Parnicky (Show Boat at Houston Grand Opera) as Susanna/Sister Mary Jo, Conor Ryan (“Jesus Christ Superstar Live in Concert”) as Johnny Blood, Peter Saide (Skin Tight) as Sheriff Green, and Nick Wyman (Les Misérables) as Governor von Richterhenkenpflichtgetruber. Desperate Measures is a hilarious new musical that tells the tale of Johnny Blood, a handsome young man whose life is in danger over a saloon brawl. Set in the early 1890’s, Johnny must put his fate into the hands of a colorful cast of characters including a wily sheriff, an eccentric priest, a authoritarian governor, a saloon girl gone good, and a nun out of the habit- as they all struggle to decide Johnny’s fate. Laws are broken and hearts are won as they try to find justice in a world that often doesn’t seem just. Sound familiar? Inspired by Shakespeare’s Measure for Measure, the musical is a joyful, madcap comedy that also manages to ponder the nature of justice. Will the good guys pull off the greatest caper yet, or will Johnny be left hanging? One thing is certain…you will come out smiling. Desperate Measures features scenic design by James Morgan (Cagney, Sweeney Todd), costume design by Nicole Wee (Closer Than Ever, Storyville), lighting design by Paul Miller (Legally Blonde, The Illusionists) and sound design by Julian Evans (Tick, Tick Boom, jon and jen). David Hancock Turner (Subways Are For Sleeping, Hallelujah, Baby) serves as musical director. Casting is by Carol Hanzel (Cagney) and the production stage manager is CJ LaRoche. Desperate Measures plays New World Stages (340 West 50th Street, between 8th & 9th Aves). Performances are Monday at 7PM, Wednesday at 7PM, Thursday at 2:00PM and 7PM, Friday at 8PM, Saturday at 2:00PM and 8PM, and Sunday at 3PM. Tickets are $59.00 – $89.00 (including a $2 facility fee). Premium seats are available. Call Telecharge.com at 212-239-6200. For more information, please visit www.DesperateMeasuresMusical.com. Probably written by one our amazing StageLight staff writers! Which Was the Best Musical to Movie Adaptation?